The Haggerty Auto Group may have started with humble beginnings, but through hard work, quality cars, top customer service, and support from the people of Chicago, Haggerty has grown into three dealerships, offering more choices of top American brand vehicles to our customers. We grew our dealerships the right way: by putting our customers’ trust above all else and delivering on our promises. Thank you, Chicago, for helping us grow our auto group and enabling us to offer to the greater Chicago area the highest quality in new, certified, and used cars of the top American auto brands! Haggerty Buick GMC features some of the most elegant and luxurious vehicles available in the Villa Park, IL area. Whether you are looking for a new Buick Enclave or a used GCM Yukon 4WD with SLT navigation and sunroof, Haggerty Buick GMC offers the best in Buick and GMC vehicles, including luxury brands that provide that extra flare, comfort and style you may be looking for. Our Haggerty Buick GMC dealership goes beyond selling top brand Buick GMC vehicles, however. We build relationships with our customers, providing the best in car repair and service, car loans, body shop services, and leasing in the Villa Park, IL area. Jerry Haggerty Chevrolet features the latest and best Chevrolet models to its clients in the Glen Ellyn, IL area. Whether you’re looking for the dynamic 2015 Chevy Colorado or the bold 2015 Chevy Cruze, our dealership offers the widest selection of quality new and used Chevrolet vehicles. For a one-stop Chevy dealership in the Glen Ellyn, IL area, come to Jerry Haggerty Chevrolet. We are a full-service Chevy dealership with a top of the line Chevy service center, superb finance deals, outstanding lease offers and a team of sales staff that believes great customer service is the foundation of who we are and what we do. 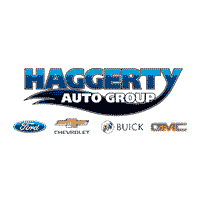 The sales team at Haggerty Ford will do its best to put you behind the wheel of a new Ford truck, car or SUV today. We offer the latest in Ford factory incentives and rebates to make sure that our clients in West Chicago, IL get the best prices available. Our dealership doesn’t merely sell a Ford truck, car or SUV and send the customer on his or her way. We believe in giving our customers the best of everything, from the highest quality vehicle and lowest possible interest rate possible to easy access to our full-service repair center and body shop, to keep your vehicle running and looking fabulous through the years. Call our sales team to learn about our fantastic Zero Down Lease Offers and talk with our finance team to learn about the various financing options available to you. Remember, we’re here to work with and for you! If you’re debating between a Buick GMC, Chevrolet, and Ford vehicle, contact us and we’ll help you find the perfect new or used vehicle. Or, get in touch with any of our dealerships directly through our websites, by phone, or in person during business hours. We’re here to help you in any way we can!